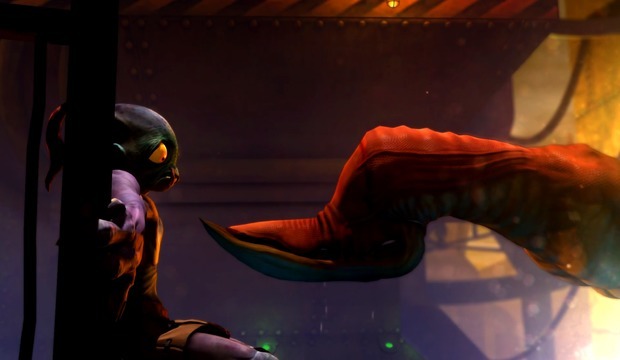 Oddworld: Abe's Oddysee was a classic title in the late 90s mainly because of the dark, uncomfortably weird journey Abe embarked on, the drastic difficulty, and of course, Abe's charismatic and hilarious personality. As great as that game was, though, it hasn't really aged well. Developer Just Add Water has decided to give this old classic a makeover ushering in completely new engine, high definition visuals and tweaking some of the gameplay mechanics to make it more accessible to newcomers. 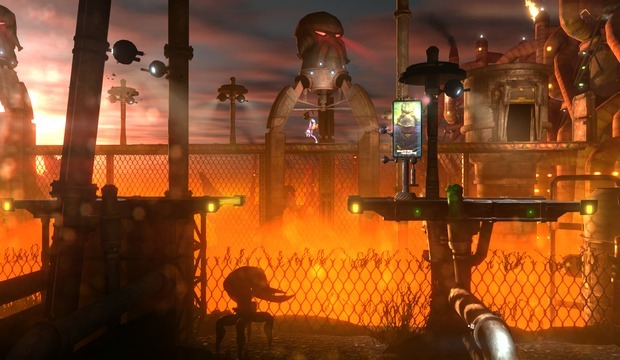 New 'n' Tasty is a side scrolling adventure that puts you in control of series protagonist Abe. Abe is a weird alien who is enslaved at the factory RuptureFarms along with his counterparts. Abe isn't really much of a fighter. The majority of the game has him maneuvering past traps, solving puzzles, and outsmarting some of the games deadly enemies. New 'n' Tasty never shies away from killing you in some pretty gruesome ways. Stepping on land mines will blow Abe into pieces leaving a pool of blood in his wake. Being spotted by enemies will leave Abe riddled with bullets. One misstep could easily result in your death. A lot of things has changed in this remake but for the most part the difficulty remains intact. As you traverse though the factory you will come across more of Abe's oppressed Mudokons. You can rescue them and lead them out of the area. If you want to experience the full game, it is beneficial to save the Mudokons. Leading them to freedom will gran you access to new areas to explore. One mechanic that has changed is how you lead these hideous little aliens to freedom. Now instead of saving one by one you are allowed to grab a group of them at once and lead them out of the area. This streamlines things and keeps you from going back to areas to free each individual one. I found myself being more cautious, though; the more Mudokons I had with me the higher chance they all could be killed instead of just one. Even though it is optional to free the other slaves, the ending you receive depends on how many Mudokons you save. I loved how Just Add Water changed the camera angles in the game as well. Instead of having each area broken up, the camera scrolls with Abe which makes the game feel like one huge world instead of broken up areas. The controls, though better than the original, sometimes still felt unresponsive and clunky. Sometimes I would try to jump forward and Abe would just jump up or I would attempt to roll and Abe wouldn't respond. This would sometimes frustrate me especially during crucial moments when I would be killed if I wasn't precise with my movements, but overall it still was a drastic improvement over the original. Other changes include Abe's bottle-caps. These have been added to the remake. You can throw bottle-caps at or near enemies to distract them. This changes the gameplay a little from the original. The enemies no longer have a set walking patterns. Distracting them can allow you to sneak past them or lead them to traps. Checkpoints have been revamped as well and a Quick Save button has been included. These changes makes the game a little bit easier now since you can just quickly save before attempting a risky move and when you do inevitably lead poor Abe to his untimely death the checkpoints are more gracious this time around. When I first start playing, the menu had a co-op option. This really caught my attention until I realized how misleading it was. The so called co-op mode isn't much more than two players that alternate control of Abe after each death. Oddworld has always been the type of game that people love to compete against each other with speed-runs. New 'n' Tasty adds leaderboards. You can upload your completion time now and see where you stand in comparison to other Oddworld veterans. New 'n' Tasty looks gorgeous. The whole game is rebuilt from scratch and it is wonderfully crafted. The 2.5D world is incredibly immersive. People who aren't familiar with the original could possibly mistake this for a brand new game. The soundwork has also been redone. Abe and company have new dialogue. Every aspect of the game feels new and sounds fresh. The "gamespeak" which allows Abe to emote by laughing, whistling, talking, and even farting (which never gets old) is a blast to use now. As the name suggest, Oddworld: New 'n' Tasty is exactly that. RuptureFarms has never looked and felt so good. 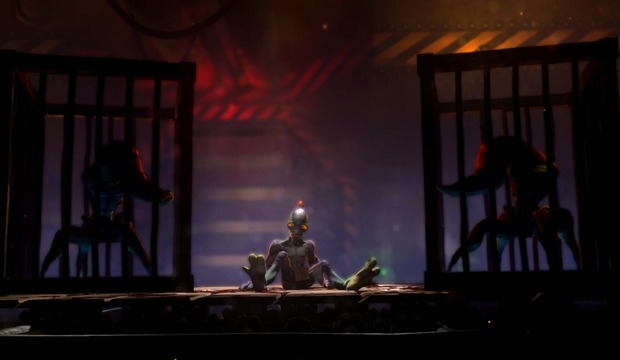 Revamped visuals, new mechanics, and an immensely fun adventure revives this classic title and reminds fans why we fell in love with Oddworld in the first place. As its title suggests, Ys Origin serves as prequel to the long-running Ys JRPG-series. It takes place 700 years prior to the events of the other games, in the world of Ys ruled by two Goddesses Reah and Feena. For many years Ys lived in peace and harmony until suddenly it all changed when an influx of demons arrived in the land. Sunset Overdrive is the definition of the word "fun." Hitman Episode 2: Sapienza builds on the first episode in just about every way. The dense multi-layered map, creative assassination opportunities, and an overall better performance makes this easily the best episode of the two so far.